Friday Finishes and Postcard Giveaway! 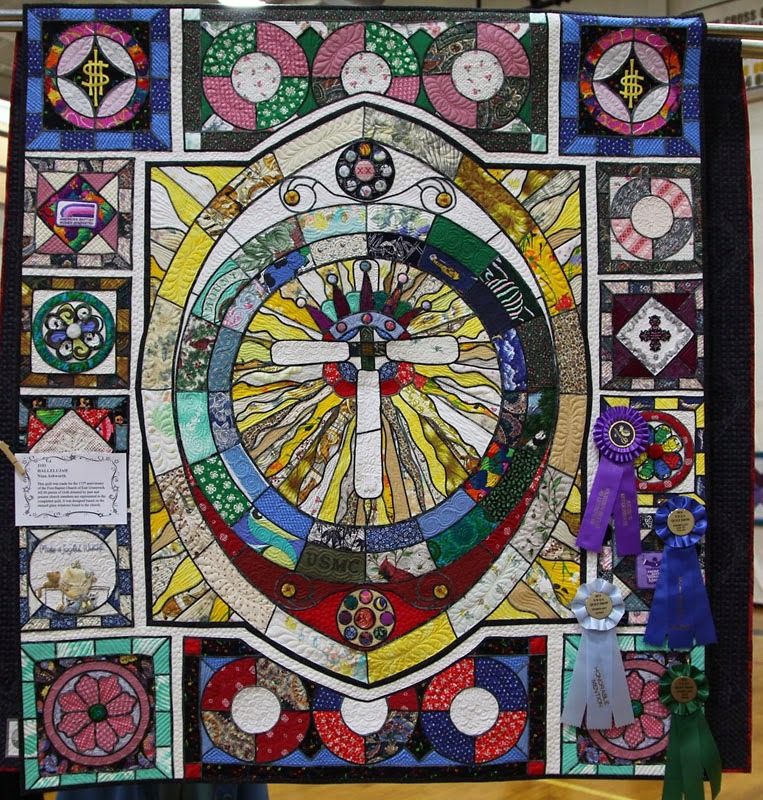 This weekend I went to our local quilt show by the Narragansett Bay Quilters. It is not a huge show but a nice one with amazing quilts. I was able to walk around for a few hours before my rib gave out and I was able to treat myself to a charm pack of nautical fabric by Janet Clare which I have plans for and some stick on thimbles for my poor fingers. There were a lot of quilts at the show and they were all beautiful but some of my photos came out blurry or the color was so off that they looked ugly. I have put the photos in my photo account so you can enjoy them at your leisure and get a better view in the larger sizes. I do have the photos at full size if you need any info on the quilt or pattern. Here is one of my favorites, you may see more quilts, HERE. This has been a long, tough week. I finally crashed and my rib went out, so no baby today and hopefully they will have day care set up for next week. I would love to have him but my body doesn't want to cooperate. 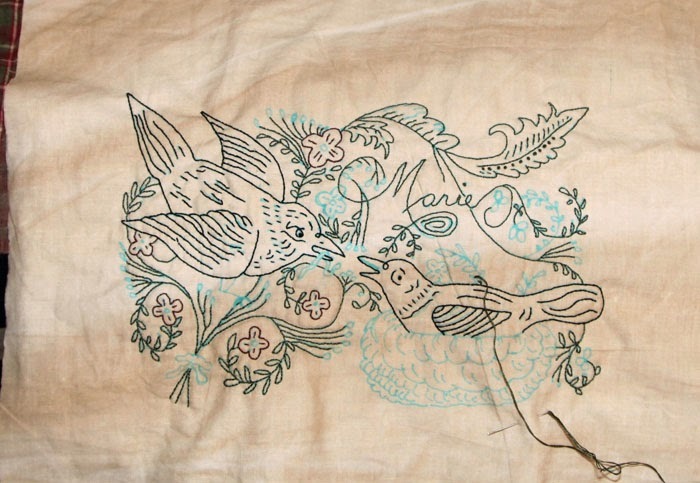 I have been working on a new stitchery from a design I found on Barbara Brackman's blog, Material Culture. Barbara did a post with Spencerian Penmanship and this one spoke to me, I just had to try it and she was kind enough to give me permission to use her photo. I tried to keep the original as best as possible, but I changed a few things to make it easier and more stitchery friendly. I still have more to do, but I love how it is coming out. I still have to decide how I want to finish it, should I make it into a pillow, a mini quilt or frame it? 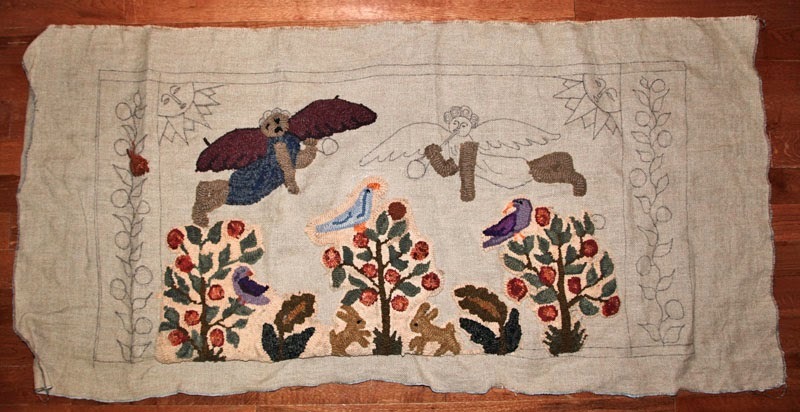 Another unfinished project I have is a rug I started years ago, I guess it is time to finish it. I was making this one for the bedroom, but I might use it in the dining room, it will all depend on where it fits and looks best. The design are elements that can be found in my Angel Blessings booklet. I see there are some spots where I did some bad hooking so I will have to fix those. I also have to find the wools that I had set aside for it. I kept the background lighter, it is a tan that I over dyed lightly to mimic the parchment in fracturs. The photo makes it look shorter, it is 52" x 24". And now for the winner...... The winner is Kim, congratulations Kim! Please send me your choice of pattern from my ecrater site. I had fun reading all of your comments and captions. Tomorrow is our local quilt show, so I am hoping to get some nice shots of the quilts at the show and I can share them with you monday. I hope everyone has a wonderful weekend. I hope everyone had a wonderful Easter or a weekend filled with fun and wonderful weather. It is so nice to have sunny and warmer days again and I am getting out for walks again. 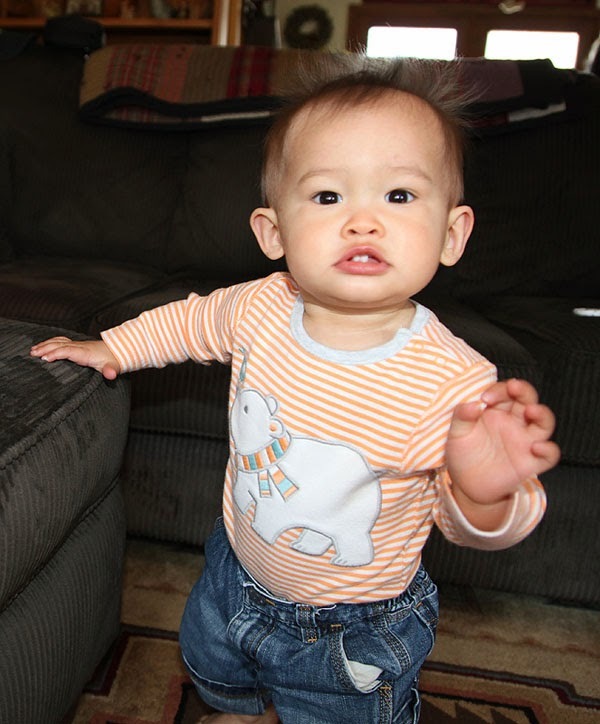 We had a nice day with the family and of course Nicholas, how can you not smile with that little guy. I am still watching him full time and they are looking for a good day care in their area. That is a problem when you live out in the country. 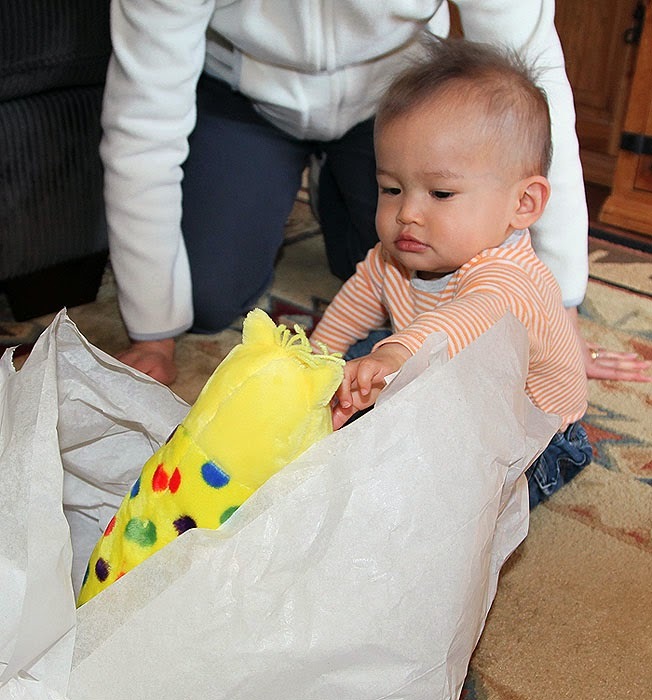 I have some photos of Nick at Easter and the last one is my favorite, it just looks like he is saying something to me. Give me a fun caption for the photo or a comment about your weekend and you will be entered into a giveaway for one of my patterns. Hopefully when I am relieved of babysitting duties, I can get back into making patterns again and finishing up those big projects that have been waiting. Since Nick is not old enough, we went simple and got him a Dr. Seuss dog and book and all of the proceeds go to kids, so a nice idea. 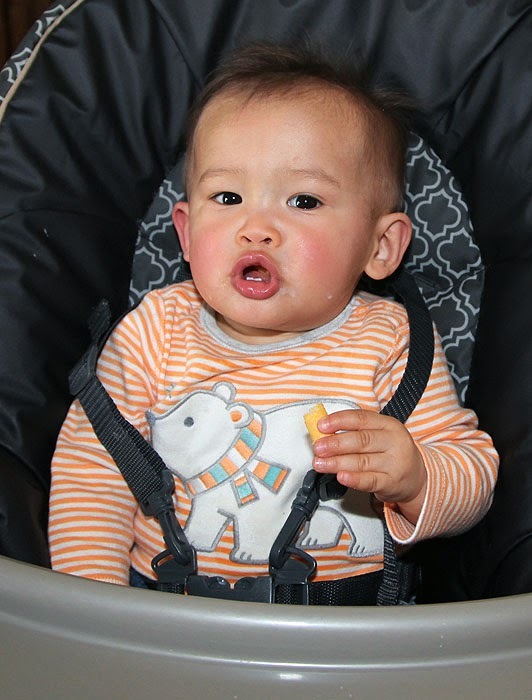 Nick had his milk and some snacks while we ate out meal. He loves finger foods. And here is the photo for the giveaway. Give it a fun caption or tell me what you did this weekend in the comment section and one winner will be selected on friday night. 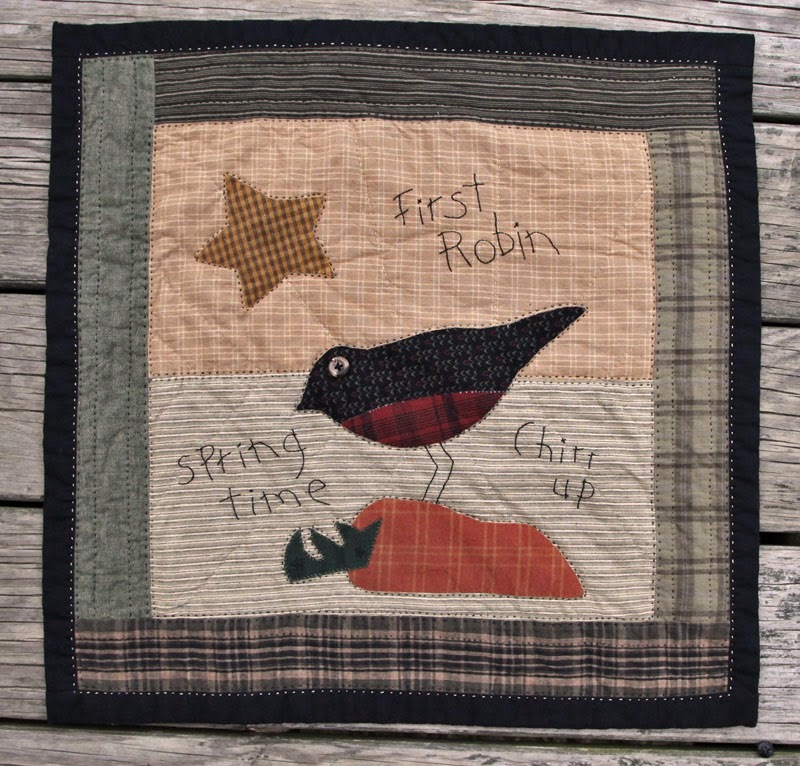 I finally finished my first robin piece. It is a design by Sarah Sporrer. The pattern was given to me by my friend Karen, along with some of her older patterns in the monthly series. It was fun to work on and a nice piece to hang for spring. I added a few extra words on mine, the chirr-up is what a robin call sounds like and is said to sound like cheer up, so I thought that would be fun to add. I hope you enjoy my newest piece. It is much darker and prim in person. And now for the winner.... The winner is .......... Jacquie! Please email me with your choice of epattern from my ecrater site. I had fun reading all of your ghost stories and I think we all have similar stories and folk lore in our areas. I wish you all a wonderful Easter and blessings no matter what spiritual path you follow. This weekend was beautiful and the perfect weekend for some outings. 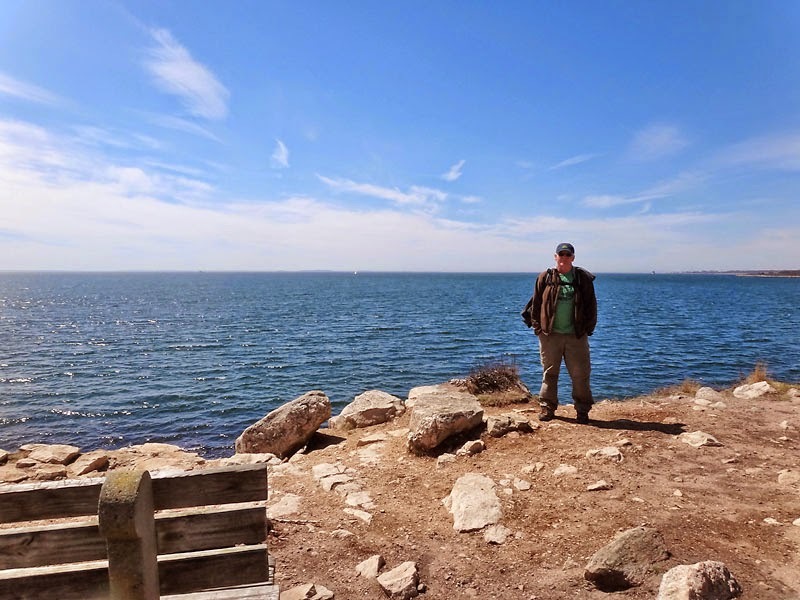 One of the places I have been wanting to go is Bluff Point in Connecticut. 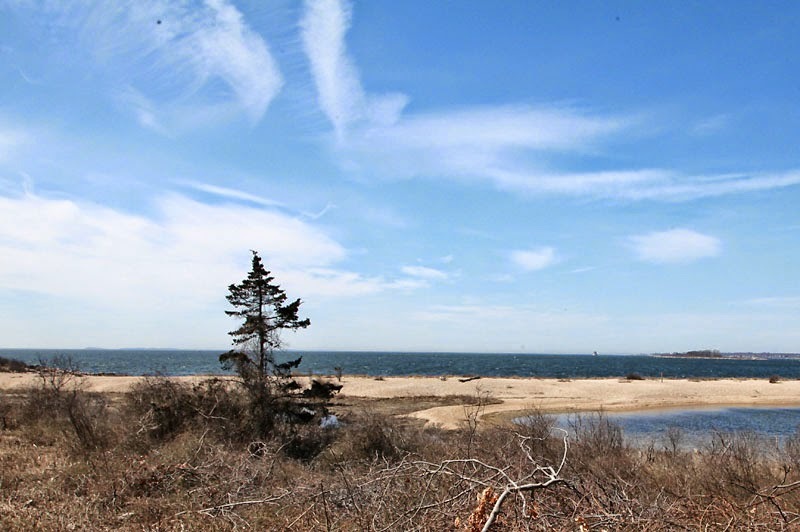 It has trails that go around the peninsula and you can also go biking and kayaking from the park. We decided to try a hike around the trail and it gave us a chance to see how good the trails were for biking, which I will try next time. 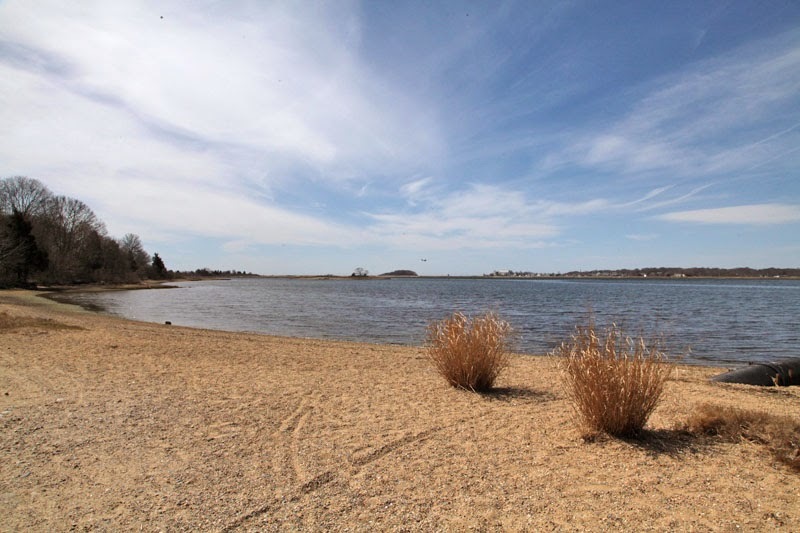 There is also a nice area for parking at the boat launch with sandy areas to launch from, so that is also on the to do list, this year. 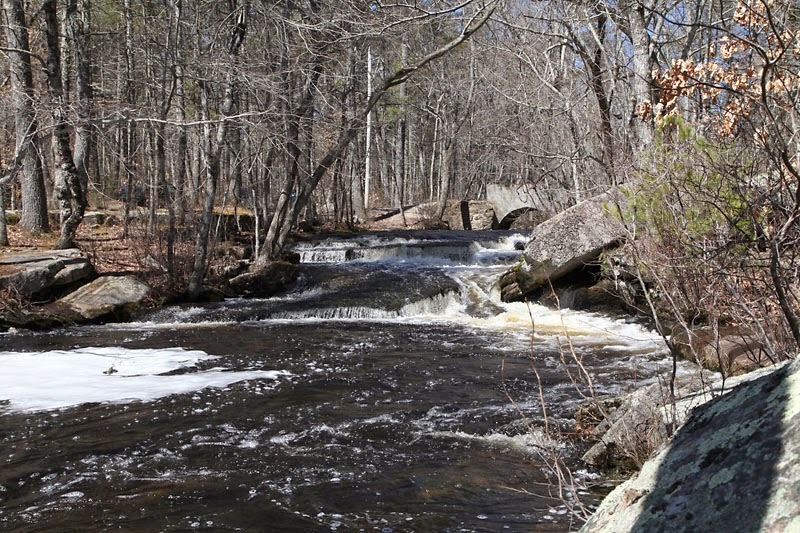 The trail follows the river that runs in and out of the Long Island sound. Beautiful views right from the start. The trails are perfect for biking too. Lots of areas to stop and walk along sandy beaches. It come out to a long sandy beach, perfect for when we go paddling. A great way to paddle at the ocean but still be in protected waters. 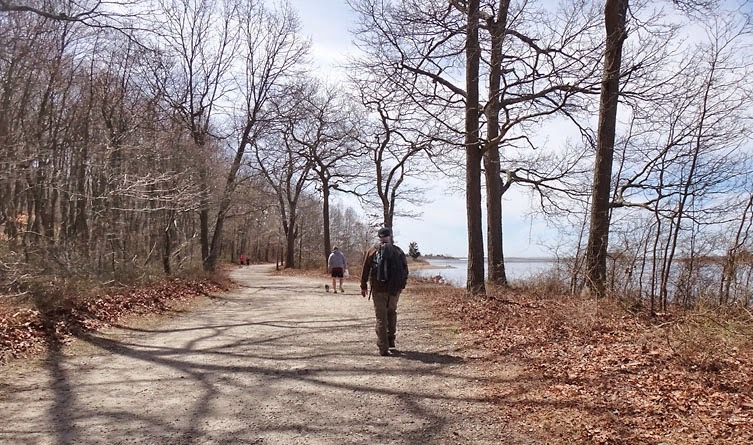 The trail comes out to Bluff Point, the perfect place to enjoy the views and the islands. 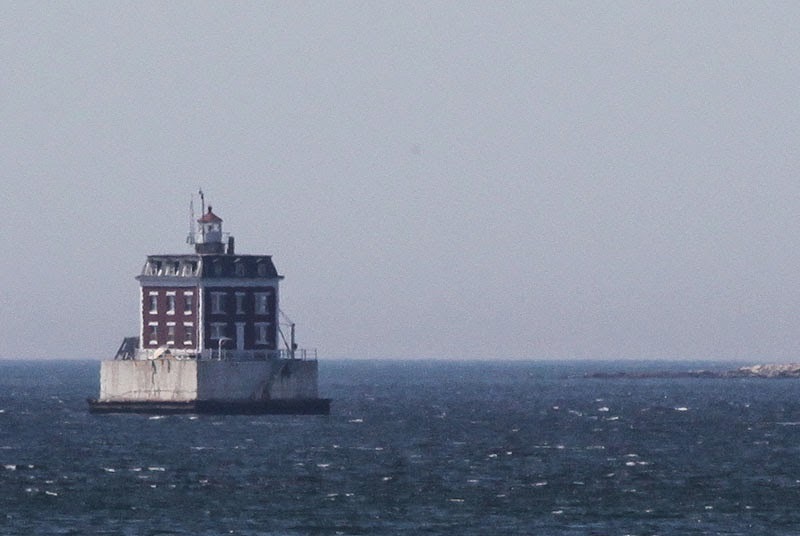 You can also see the Ledge Lighthouse, it is said to be haunted by a former light keeper. Now it is automated and run as a museum and learning center. And here is where you can enter the giveaway. Tell me about a haunted place in your area and I will pick a winner on friday and announce it that night. The winner can have their choice of any one of my epatterns. If you don't have a haunted comment, any comment will get you entered. On sunday we went to the bird sanctuary and saw an amazing variety of sea and land birds, but none of my photos were good enough to show, my zoom can only go so far before getting fuzzy. 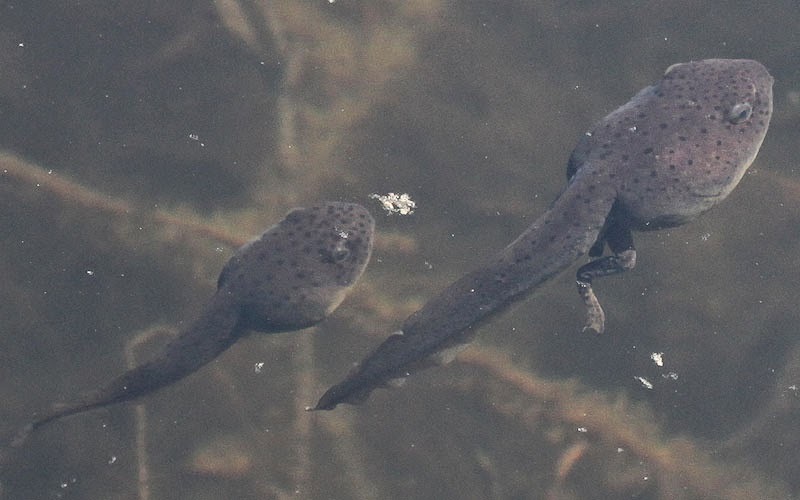 I did get a fun shot of the new arrivals at the pond, this guy has a good start on hopping. Well, I haven't said that since I had my last job, lol. I have had the baby all day, all week and it has been a long week. He is such a joy and he loves to be loved and loves the attention grandma gives him but it sure wears grandma out. They are looking into day care so we are trying to work it out so he can stay there 3 days a week and 2 days with me. That will help them to save money and not wear me out. 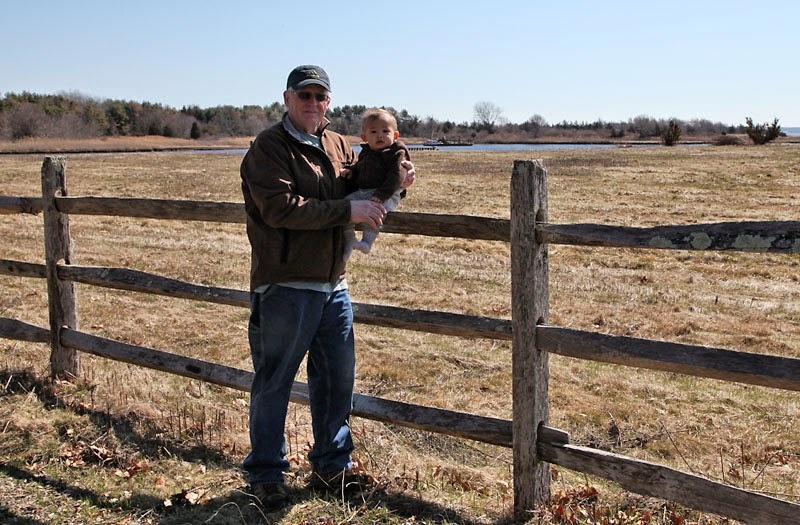 We got some nice days this week so Nicholas got to enjoy going for a walk with us. Everything fascinates him and he loves being outside. 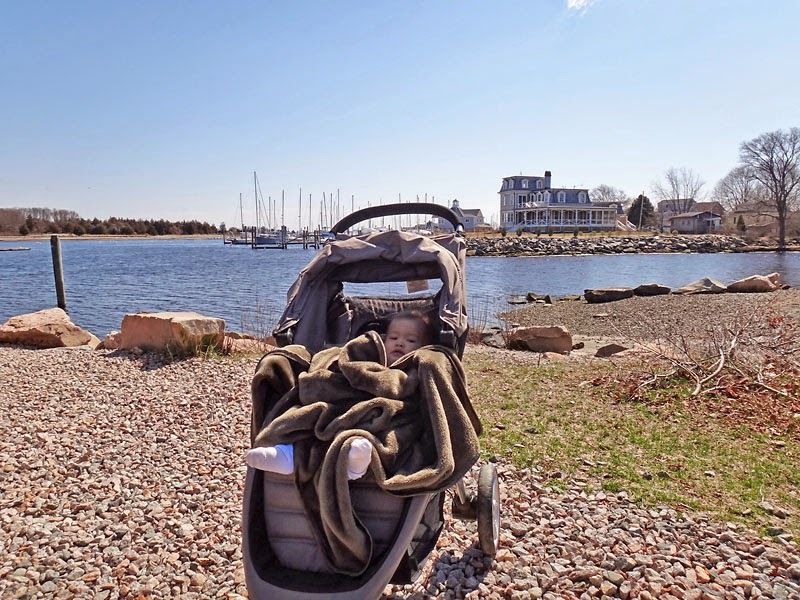 He loved walking along the bike path at the town launch, lots of water and seagulls to enjoy. I wonder how small they make life jackets, I bet he would love to go paddling, lol. The next day we went to the new bike path in town, we just walked along the last end. It goes past marshes and inlets, so nice views. I have to see if we can find a used baby bike trailer to pull him in. Now grandma can rest for the weekend and enjoy some hikes and some sewing time. I hope everyone had a nice weekend. We finally got some warmer weather and I was able to get out and enjoy the fresh spring air. Yesterday was the best day, warm enough to hike but still cool enough to enjoy it. We went to my favorite place, Stepping Stone Falls. The rain storms have filled the rivers up nicely and the falls were roaring down the rocky steps, I love the sound, it is so soothing. 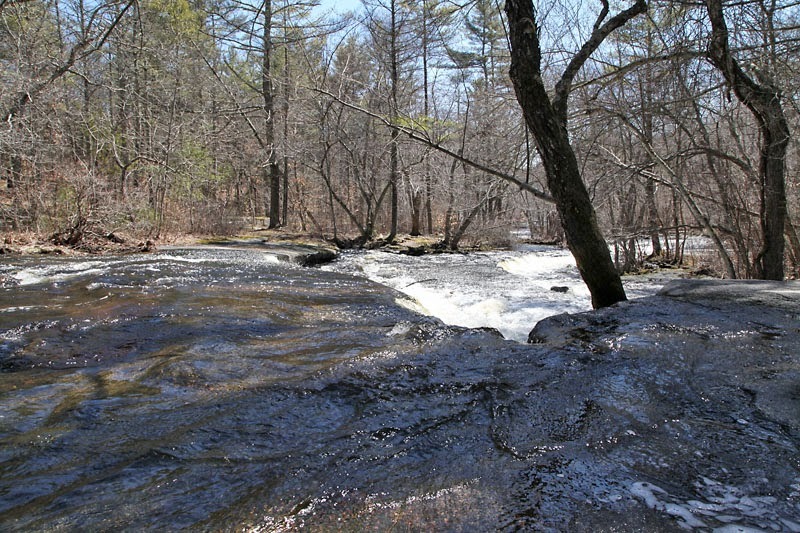 This is a spot that we usually like to sit and enjoy the falls, but in the spring the falls fill the entire rocky area. And now for the giveaway winner.... The winner is Saundra of Woodland Junction! Congratulations to Saundra, please email me with your address so I can get your card out to you. 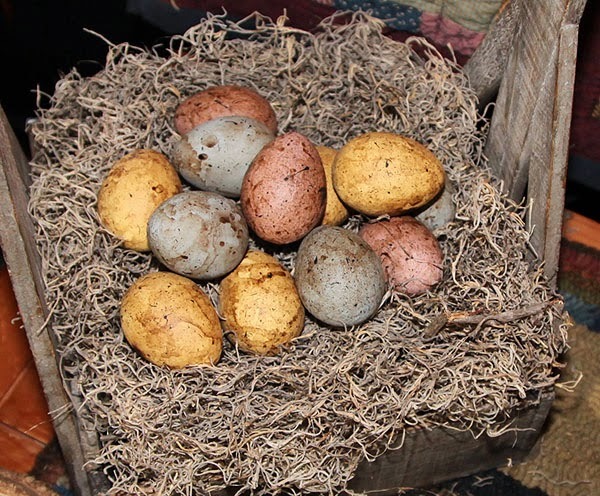 This week I wanted some eggs to fill a basket and love the look of speckled eggs. I didn't like the ones in the stores or the prices, so I decided to make my own grungy eggs. I found paper mache eggs at Jo anns and I had coupons, so I got a couple of packs at half the cost. I painted them with acrylic paints and let them dry for a day. After that I tried watered down walnut ink on them but it kept dripping and sitting in a box left some blobby spots, so not the best way to age them. I think the best way would have been to sponge it on and use less water with the ink. After I aged them, I used black acylic paint and splattered spots on them with an old toothbrush. The trick to getting a speckled look is to not over load your brush with paint and keep the paint at the top of your brush. Not perfect but not bad, nice prim look for Easter. I started out with an eggshell white but decided I wanted colored eggs. I have my little bird sitting with it and a bunny next to it, but moved them so I could get a clear shot of the eggs. I also made another postcard and want to share this one with my readers. I forgot to stain the card first, so it got done after I painted the design. 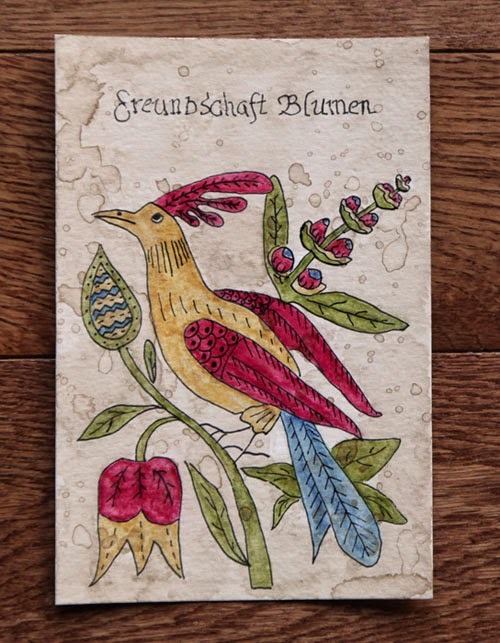 I wanted to add a saying but there wasn't enough room, so I added "Friendship Flowers" in German with fraktur font. To enter for the postcard, you must live in the US, 48 contiguous states. To enter leave a comment and if you have ever sent a postcard out of the US, what area did you send it to, and what was the cost to that area. Or a card sent in an envelope, which is what I would do if I sent it that far;) I will pick a winner on monday night. If you have never sent something overseas, that is ok too, just leave a comment to let me know you are interested. Postcard is done in watercolor pencils and antiqued with walnut ink.